KM wrote: Lovely work as always, someone will be a happy piper to receive them. Are you back on the ebony again David? Is the mainstock ebony? The mainstock is ebony, supplied by the customer. No, I'm not back to using ebony. I'm just wrapping up a few of the last orders we took before the ebony embargo. This is my recently received Taylor-style concert pitch chanter made by Michael Hubbert, in ebony, German silver and mammoth ivory. The external design of the chanter is copied from an original Taylor that Michael had in the shop for restoration when I first approached him about this project. It's modeled on the block-keyed Taylor design, rather than the ribbon keyed (I already have a Taylor-style ribbon-keyed chanter made by Patsy Brown). The bore is his standard bore based on Crowley. The chanter top is an original circa 1920 top that came with my old Taylor-style set. I asked Michael to restore and reuse the original top, which he has done adding a new stop key, new top mount and intake pipe. 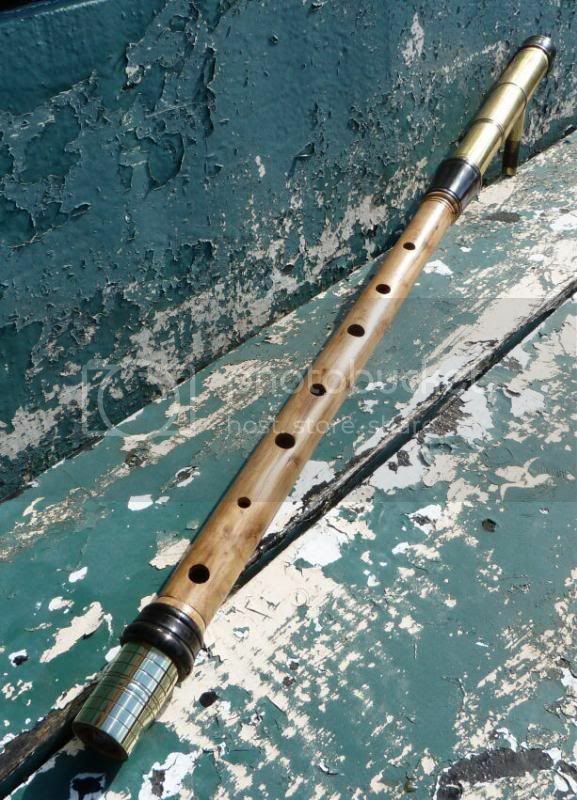 To my knowledge this is the first time Michael has made a chanter to this particular design, and it is stunning. A Taylor-style set in D, ebony, NS and boxwood. Lovely. Where in the world will this set be going? very nice, how long does it take to do all that metal work? Yes - beautiful work Mr Quinn . I see that you will no longer be using ebony. I think that all instrument makers should be thinking in terms of alternatives to tropical hardwoods. I've suggested ornamental figured ebonite as a suitable alternative - I'm wondering if it's something you would consider, bearing in mind the surface density issue? PJ: To a customer in the USA. I hope you'll understand that's as much as I can say. Dr. Plod: Forever. Or so it seems. Outo'box: If someone made a suggestion based on experience, I'd consider it. Otherwise not. I agree - the sustainable forestry project, on the face of it, looks like a good one - if instrument makers are prepared to use it to source their hardwood and the chain of supply can be properly certified all the way along the line. I take it you are sourcing all of your hardwoods from this project Chris? The problem, as in the case of the ivory trade, is that if a market continues to exist, then it will inevitably be ruthlessly exploited by those, both at the supply and demand end, who have zero interest in the conservation of endangered forest habitat. Curbing the market for ebony at the demand end must be a better approach. Less demand from instrument makers,including pipemakers, should mean less forest clearance by loggers in search of ebony trees for their chainsaws to supply that demand. outofthebox wrote: Less demand from instrument makers,including pipemakers, should mean less forest clearance by loggers in search of ebony trees for their chainsaws to supply that demand. What about less demand from musicians? A pipemaker will generally make an instrument only if he has a customer for it. If you specify for your pipemaker that you want your pipes made from wood from sustainably managed forests, he'll certainly listen. In any case, CITES and prohibitions on illegal logging (e.g. Lacey Act) make it very difficult for illegally harvested timber to make it into North America and the European Union, where the vast majority of pipemakers are located. Hi, my first post here ! Here are somE pictures of my. 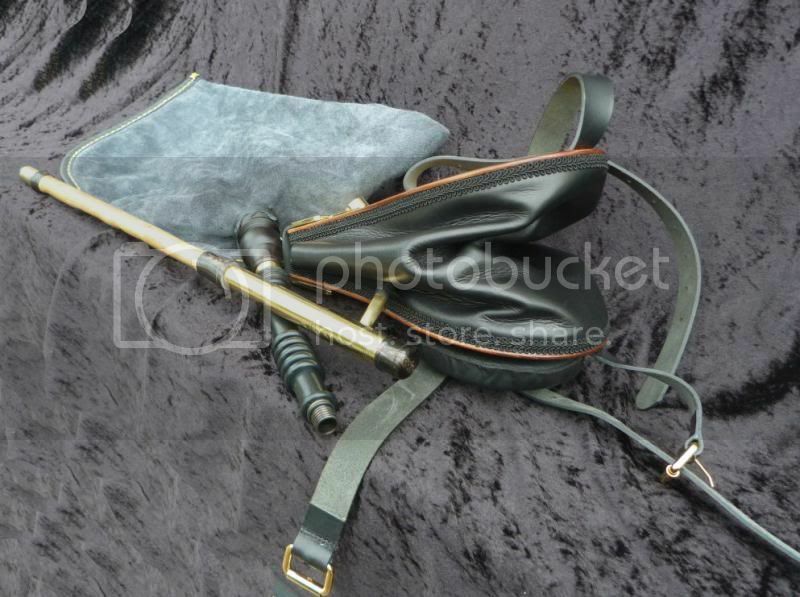 Left handed half set --- Brass and Ebony, pitched in D. Made by Mickey Dunne, County Limerick. LOt of nice sets of pipes on this thread and mine isn't as nice but it sound and plays well. this is my set that I put together on a tight budget over last few years. bellow is something i put together. I used synthetic belting and plastic snaps as they are quicker to adjust and bit more comfortable for me. chanter is David Daye Apartment chanter that I got 4 years ago. it has nice clean tone and works nicely with decent volume . (small bore chanter) I believe I got one of the first penny chanter with delrin body on this size. i made my own windcap and did some minor work to make it look nicer. Recently I wanted a set of drones, but nothing was available on my budget or time, so i bought a cheap 200 buck pakistani set and took the drones off. and sold the rest on ebay for cheap practice set. These drone required complete reboring/sizing, some cutting and replacing bent bass drone tubes. So, in the end, the pakistani set was used mostly for the materials. i matched the dimension off daye's site for harrington drones and made the synthetic reed to go with them. They took bit of work, but they sound great and cost me less than 100 bucks and I feel they look fairly nice. I am pretty happy with the result. They are very stable and robust drone. 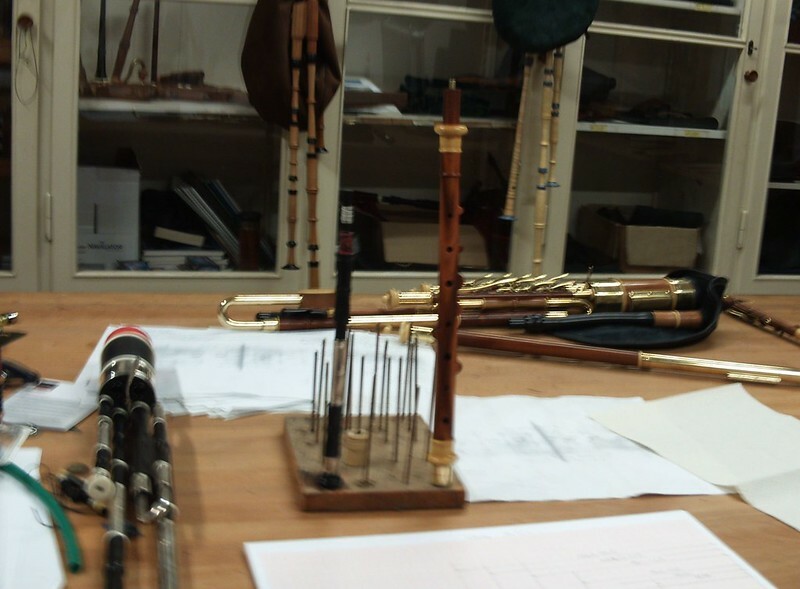 Getting the chanter and drone balanced took quite a bit of effort, but I've learned a ton about both chanter reed and drone reed in the process and end result was quite worth it. anyway. I've been playng irish flute/whistle for 20+ years, played highland pipe, but now I mostly play my whistle and uilleann pipes after taking few years off. my younger son has started on whistles as well, so I've been enjoying playing with him. 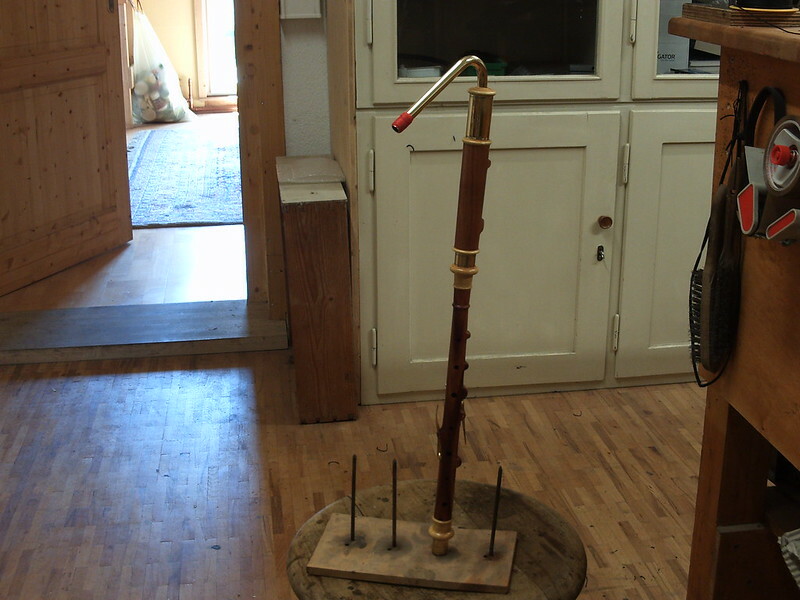 Got a couple of photos from Andreas Rogge of my NBD lefthanded chanter Plumwood with boxwood/brass and 4 keys.